The tradition of Belarussian party continues, as it impresses with its lavishness. A galaxy of Eurovision stars past and present, including Koldun, Polina Smolova, and Ruslan Alehno entertained thousands of delegates at a party that will be talked about for years to come. This was held at the cavernous Euroclub/Eurodom, starting at 11pm. Our genial hosts included former Belarussian entrant Koldun. You could tell they’d really pushed the boat out, with gifts aplenty. The first act on was the Belarussian winner of Junior Eurovision Alexiy Zhigalkovich. He performed a brand new song. He was followed in quick succession by Ruslan Alehno, Polina Smolova, and of course Koldun himself. 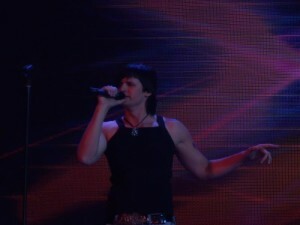 Gunash, from this year’s Belarussian final also performed. Notably at Eurovision parties, something comes along that you never ever expect. Former Russian performer Natalya Podolskaya next appeared on stage. What would she sing? “Nobody Hurt No-one”? Yes. What else? “Somebody to love” by Queen was the answer. She had an interesting take on this 1970s classic, and many in the crowd were variously surprised, bemused and elated by this choice. Once the Belarussian performers were out of the way, the tradition of other performers from this year’s contest have their turn continued. Krassimir, Sasha Son, Intars Busilis, De Toppers, Next Time, Nelly Ciobanu, Chiara, Svetlana Loboda and Sakis Rouvas all sang to the increasingly excited crowd. In fact, the Belarussian parties have become legendary, and this year’s was no exception. Many of us in the crowd had been to these things for many years, and it was pitched about right. Our hosts also had the foresight to make the bars all free all evening, which added to the fun atmosphere. Once the last act had performed, the stage was set up for a percussion band. Various mixes of non-Eurovision songs. People were starting to leave at this point, but it was very good background music to discuss the finer points of the evening, and decide who was going to win. All in all, a very good evening. Thank you Belarus.